TripAdvisor named Nuevo Vallarta was named third “Best Beach Destination” in Mexico; Classic Vacations recognized the Riviera Nayarit and Puerto Vallarta were recognized as the best partners of the year; and Marival Residences received an award on behalf of Price Travel. The Riviera Nayarit received ample recognition for its beaches, its hotels and its excellent promotional efforts from several industry businesses during the 2016 Tourism Tianguis held in Expo Guadalajara. “The Tianguis Turístico is a recognized international forum and it will always be important to stand out during these events. To be receiving awards during this showcase helps create an even bigger buzz around all the good things we have to offer,” said Marc Murphy, Managing Director of the Riviera Nayarit Convention and Visitors Bureau (CVB). During the event, Omar Camarena, Secretary of Tourism for the State of Nayarit, and Marc Murphy, Managing Director of the Riviera Nayarit CVB, received an award from TripAdvisor naming the beach at Nuevo Vallarta as the third “Best Beach Destination” in Mexico. Meanwhile, David Hu, General Manager of Classic Vacations, handed the Riviera Nayarit and Puerto Vallarta the “2015 Classic Mexico Vendor Award” as the best partner destinations of the year praising the excellent work done by the joint promotional campaign. And last but not least, Price Travel singled out the Marival Residences Riviera Nayarit hotel as the best luxury hotel in Mexico. Esteban Velázquez, President of Price Travel, was present to confer this recognition on Alfonso Rizzuto, President of Grupo Miraval. 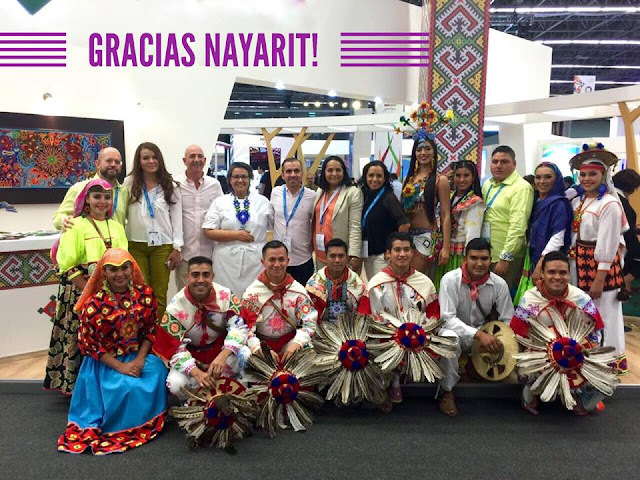 At the close of the 2016 edition of the Tianguis Turístico, the Secretary of Tourism of Nayarit published a thank-you message for all of Nayarit’s participants this year. “#Nayarit shone during the #TianguisTuristico2016 thanks to its beauty, its traditions, its gastronomy and the hospitality of its people. A big thank you to the CVB team, the hotel representatives, the Nayarit Secretariat of Tourism, the Ballet Mexcaltitán and all who made possible this outstanding representation of our state during this international event,” published Omar Camarena.